Last week, Ruth Quinlan, one of our local neighbours, taught me how to make Sfouf. The original recipe is from her friends’ cookbook “Syria, Recipes from Home” by Itab Azzam and Dina Mousawi (available on Amazon here). Ruth is an absolutely fantastic chef, who has worked at The Eagle, the E5 Bakehouse, and ran a private catering company in Ibiza for many years. She also cooks a monthly Syrian Supper Club, and last week she cooked for one of these at the Mill, as a one-off evening down here for some of our friends and neighbours. This cake became the dessert for the night, served with Ruth’s poached pears with blackberries, and a dollop of crème fraîche. We also added some dried edible rose petals to decorate, which lends a pretty splash of pink if you can get your hands on some. Ruth has slightly adapted the original recipe to include 50g less butter, and ½ tsp less turmeric (adapted version below). She also recommends you can add a teaspoon of rosewater to the icing sugar glaze if you like. It was an absolute pleasure to learn how to make this in Ruth’s kitchen in Tetbury, and the spicy, aromatic flavours really warmed up a crisp autumn evening. For more information on Ruth and her classes, or for a link to the Syrian Supper Clubs, you can see her website here. A huge thank you to Ruth for all her time and delicious food, and to the authors of the recipe for letting us share it. A note on gluten-free: to make this cake as a gluten-free option, simply replace the semolina with fine polenta. Also make sure the baking powder you’re using is gluten-free. “Heat the oven to 160°C/320°F/Gas mark 3 and line a round, 23cm springform tin with baking paper. While the cake is in the oven, make the sugar syrup. Add the sugar, lemon juice and water to a pan and simmer until the sugar dissolves. The longer you simmer it for, the thicker the syrup will become, 10 minutes should be about right. 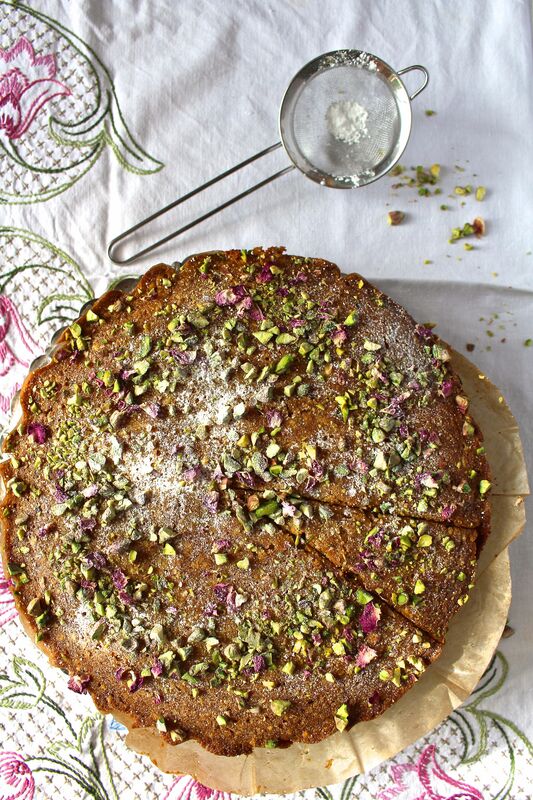 Recipe from “Syria, Recipes from Home” by Itab Azzam and Dina Mousawi.